22nd September 1880, Manchester, England. Christabel Pankhurst was the eldest daughter of Dr Richard Pankhurst a radical lawyer and Emmeline, a prospective Parliamentary Candidate for the Independent Labour Party in the 1895 General Election. 1882: Her sister Sylvia is born. 1889: Death of her father Richard of a perforated ulcer. 1901: Christabel meets Eva Gore-Booth who was trying to encourage working women in Manchester to join the National Union of Women’s Suffrage Societies and is so impressed with her work that she joins the movement also, closely followed by her mother Emmeline Pankhurst and her sister Slyvia. 1903: Foundation of the Women’s Social and Political Union (WSPU) in Manchester as a breakaway to the National Union of Women’s Suffrage Societies. 1905: Christabel Pankhurst and Annie Kenney are eventually jailed in October after being thrown out for disturbing a Liberal Party meeting and “assaulting” police officers. They refused to pay their fines. 1906: Her mother Emmeline Pankhust now organises the WSPU activities from London. Many marches and rallies are held and the Liberal Candidates are targeted during the elections. The women disturb Cabinet Meetings. The Daily Mail newspaper sneeringly described them as Suffragettes but the movement adopted the title with pride. 1907: Christabel is amongst Suffragettes arrested in Parliament Square in London on 13th February. 1908: Christabel Pankhurst becomes known as “Queen of the Mob” and makes protests at the Peckham By-Election. 1909: Receives her third and last prison sentence, ten weeks in Holloway Women’s Prison after the so called “Rush Trial” at Bow Street in London. She becomes such a celebrity that she is sculpted for Madame Tussaud’s waxworks museum. 1910: The Pankhursts and their followers try to get into the House of Commons on 18th November to see the Prime Minister Herbert Asquith to protest against the dropping of the Conciliation Bill, which would have given votes to women. The meeting breaks out into a riot as the women charge police lines and over 100 are arrested. 1912: The WPSU becomes increasingly more militant under the influence of Christabel who flees to Paris to avoid arrest, and arson attacks, window smashing and vandalising works of art take place. Emmeline is arrested twelve times during the year and serves a total of 30 days in jail. 1913: The so called “Cat and Mouse Act” is brought in. The Prisoners (Temporary) Discharge for Ill-Health Act which means that hunger-striking prisoners can be released until they are well enough to serve the rest of their sentences to avoid the problem of force feeding. 1914: At the beginning of the First World War Emmeline and Christabel call off their Campaign to support the War effort and all suffragettes are released from prison. She tours the United States, Canada and Russia to encourage the mobilisation of women. 1915: The WPSU changes the name of its newspaper from “The Suffragette” to “Britannia”. 1917: The WSPU changes its name to the Women’s Party. 1918: The representation of the People Act gives the vote to Women over 30. Christabel stands for Parliament in Smethwick, near Birmingham and is narrowly defeated by the Labour Candidate. 1919: Becomes the prospective parliamentary candidate for Westminster Abbey Division but the campaign comes to nothing. Nancy Viscountess Astor becomes the first woman to be elected to parliament in the constituency of Plymouth after her husband moves up to the House of Lords. The Pankhursts go on a lecture tour of America. 1920: Christabel Pankhurst writes a series of articles for the “Weekly Dispatch” Newspaper. She begins to turn towards religion. 1921: Christabel goes to Canada with Betty and Grace Roe in August. She starts to preach as an Adventist. 1922: She preaches at the John Knox Presbyterian Church in Toronto. Publishes her first religious book in New York, “The Lord Cometh”. Starts her second book “Pressing Problems”. 1925: In January Christabel predicts that the nations of Europe will be ruled by a Dictator who will be the forerunner of the Antichrist at the Ascension Mercurial Church in New York. Spends periods of time in Bermuda writing works such as “The Worlds’ Unrest” “God’s Remedy for Human Failure”. 1926: Christabel Pankhurst returns to London and addresses meetings in Bristol, Cardiff, Birmingham. Manchester, Liverpool, Dublin Edinburgh and Glasgow. 1928: The amended “Representation of the People Act” is passed a few weeks after the death of her mother Emmeline which gives the same voting rights to women as to men. 1929: Pankhurst begins six-month tour of the USA and Canada. On the 8th December she attends a memorial service for her mother in Washington. 1930: She is not present at the unveiling of the statue of her mother in London by Prime Minister Stanley Baldwin. 1931: She preaches in the same service as David Lloyd George at the Welsh Baptist Chapel in London. (September) Visits Winston Churchill at his home at Chartwell in Kent. 1932-39: Christabel spends most of her time in England with occasional tours to the United States. 1936: On 1st January she is appointed a Dame Commander of the British Empire and lives a comfortable existence from her income from her books and lectures and from money from wealthy friends. She is the principal beneficiary in at least three wills over the next few years from some of her admirers. 1939: Christabel Pankhurst spends the last years of her life in or around Los Angeles and withdraws from public life. 13th February 1958, Los Angeles, United States of America, found dead of heart failure in her chair by her landlady after giving a speech on her essay about her mother Emmeline Pankhurst. (Rumours persisted that she had committed suicide). Buried at Woodlawn Cemetery, Santa Monica, United States. A memorial service was held at the church of St. Martin’s in the Field, London. Womens Library, Old Castle Street, E1 7NT. 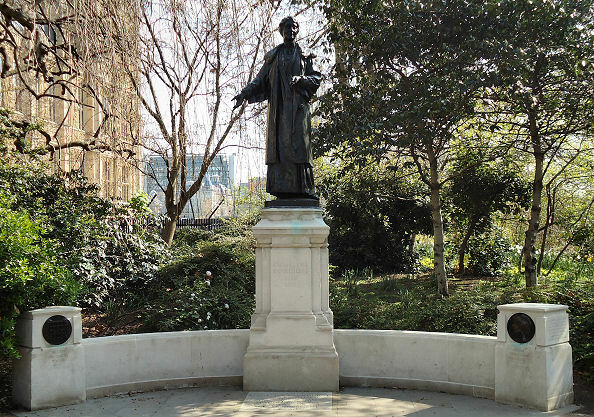 Statue to Emmeline Pankhurst in Victoria Tower Gardens next to the Houses of Parliament. Contains a plaque to Christabel on the right hand side. Pankhurst Centre, 60-62 Nelson Street, Manchester, M13 9WP.